Authlogics Authentication Server provides a secure interface to manage, and authenticate users against identity information stored securely in Microsoft Active Directory or SQL Server, locally or from cloud-based applications. It allows help desk employees to provision and manage user accounts whilst users are able to update passwords and enable soft token devices through the Self Service Portal. An API is also provided to enable flexible integration with 3rd party applications. Authentication Server provides a complete cost-effective multi-factor authentication, password replacement, and single sign-on authentication solution for traditional desktops, over the phone, in the browser or from any device. It was engineered with the belief that good security practices are realised by creating products that are simple to configure and use, without loss of flexibility or accountability. Both Active Directory (AD) and Microsoft SQL Server are supported as identity databases. Active Directory is recommended for most scenarios especially if the user accounts already exist in AD. Although data is stored directly in AD, no schema extensions are required. SQL Server is recommended for hosting environments or where AD is unavailable. Information is secured using FIPS 198 & 180-3 compliant cryptography. Multiple users can be provisioned and managed through a familiar MMC snap-in interface – 10000 users can be provisioned in under 15 minutes. Role-based access permissions determine who can perform which tasks, while extensive logging ensures that everything is tracked to satisfy auditing and compliance requirements. Users can securely reset AD passwords and manage their account via the Self Service Web Portal included with the server. Authentication Server supports multiple varied and flexible MFA scenarios and authentication types, such as traditional SMS message-based 2FA or more secure OATH (Open AuTHentication) compliant (RFC 4226 & 6238) protocols, as well as transaction signing, via the free Authlogics Authenticator soft token app. A user can have up to 10 soft token devices at once and they work 100% offline. Agents are provided at no additional cost to support improved Windows Desktop Login and Remote Desktop Login processes, as well as cloud single sign in via the ADFS agent, and support for RADIUS. Additional integration into 3rd party solutions is available via web service or through direct API calls. Authentication Server works with logon agents and custom integrations to provide three different and complementary authentication technologies. Use PINgrid, PINphrase and PINpass to deliver two-factor, one-and-a-half factor or multi-factor soft-token and token-less, one-time code authentication capabilities. They provide the IT department increased security combined with ease of administration, without the associated costs of purchasing and managing a traditional hard-token based system. PINgrid is a simple-to-use but robust authentication technology which uses a secret user-generated shape or pattern to generate a one time code. Your pattern remains secret but the code it generates changes every time you logon. PINphrase challenges the user to provide random characters from a memorable phrase previously provided by the user. PINphrase is the only off-the-shelf solution that enables an organisation to implement the ‘memorable information’ form of authentication, popularised by retail banks. PINpass is a simple to use OATH compliant 2 Factor Authentication used to implement a 100% standard security solution. Use PINpass to provide One Time Pins on the go without the cost and complexity of hardware token OATH or OTP solutions. We follow a clear, simple licensing model with a single per-user monthly subscription cost. There are no hidden fees or additional costs, and you can optionally increase the level of support from our Basic 8 x 5 to Premium 24 x 7 packages. 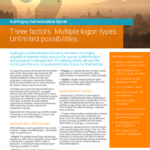 Authlogics Authentication Server can be installed on multiple servers without additional cost. The user licence includes the use of Windows Desktop Logon Agent, Remote Desktop Agent, access to Azure, Office 365 and cloud login via single sign-on, and use of the Authlogics Authenticator app. Pricing becomes more cost-effective the more user licences are purchased. Preferential pricing and NFR licences are available for managed service providers and partners.